In Iran, the word “village” brings to mind a place without water and electricity, with sheds made of mud and adobe. So, shortages and deficiencies are inherent to the word village. The burden of such intolerable life, of course, is carried by women and girls who have to respond to the needs of their families despite the fact that their own special needs are never responded to. The life of Iran’s rural women does not comply with any humane, let alone, international standards. Rural women in Iran are “forgotten” human beings who are deprived of the most basic requirements of a decent life. Albeit tragic, the statement does not reflect the whole truth. 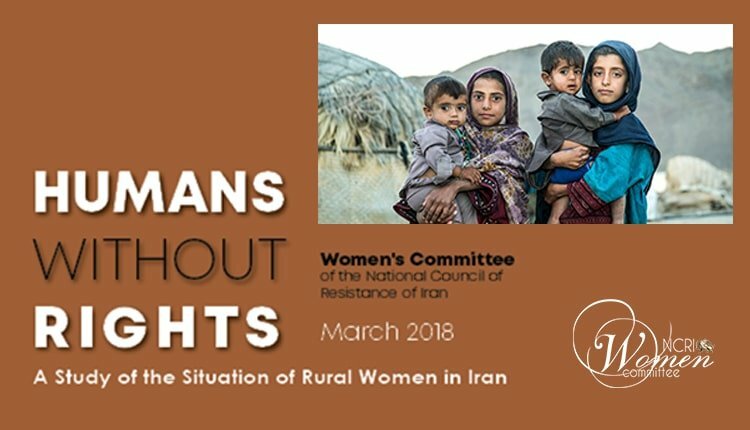 On the one hand, there is no transparency on the situation of rural women in Iran. On the other hand, the situation of Iranian women in general is deplorable since their rights have not been respected in the law and are discriminated against because of their gender. According to Article 1210 of the Constitution, a girl is mature when she is 9 lunar years. Article 1041 sanctions marriage of girl children at the age of 13 and even younger with the consent of their father. Article 1105 of the Constitution reiterates that man is the head of the household. Article 1117 states that man can prevent his wife from being employed in any profession or industry if doing so contradicts the family’s interests. According to articles 1123 and 1124 of the Constitution, a man can divorce his wife if she gets sick. Whereas woman faces numerous obstacles in filing for divorce. The few abovementioned examples violate Iranian woman’s basic rights. Naturally, the situation is much worse in the case of women who live in rural areas as they also have to grapple with absolute poverty and destitution. The information in this report has been compiled from a limited number of reports which appeared in the state media. Noteworthy is that most of the problems mentioned for one or two villages are common to all villages and the differences are not significant. In a country, rich in natural resources, many Iranian villagers do not have access to water even brought by tankers or drawn from wells. One of the greatest infrastructural problems of rural women is their lack of access to clean and adequate water. To study this issue, let us focus on villages in Chabahar. Chabahar is one of the cities of the underprivileged province of Sistan and Baluchistan in southeastern Iran. In fact, Chabahar is the only Iranian city that lies on the coast of an ocean. The situation of the people of 44 villages near this city and their lack of access to water is tragic. These villages do not have pipelines. Their water is provided by worn out tankers that bring them unsanitary and unclean water with long delays and in small amounts. The water they receive is kept in a metal container and plastic vessels. The water tank is not clean and the drinking water is yellow. The children in these villages are usually sick. In one case, people noticed that the children’s saliva was green. It was later discovered that there were green algae in the water tank of the village. Due to severe shortage of water, people have dug out ditches to collect rain water and this is considered as the village’s water reservoir. The ditches, called Hootag, attract flies and mosquitoes. This water is used for bathing, laundry and doing the dishes at the same time. Sometimes, when the Hootag water is fresh or the water tanker has delays, people also drink the same water. Girls as young as 10 and 11 are responsible for carrying water from the Hootag to their homes. They use big pots and place them on their heads to carry water. In 2011, a dam was built in this area on the Kajou River. The dam was supposed to solve the water problem of several villages but there was no system to transfer the water to villages. So, the water remained behind the dam and evaporated and villagers remained thirsty. For every person living in these villages, only 15 liters of water has been considered which is not sufficient at all. A look at the daily consumption of water around the world helps one realize the magnitude of water shortage. The world’s lowest per capita water consumption is in Malaysia where people use 90 liters of water per day. In some countries, the daily consumption of water for each person reaches 240 liters. Agriculture and husbandry in this region are being totally annihilated due to shortage of water. The water condition is the same in all villages across the country. Alireza Ebrahimi, secretary of the assembly of representatives of Golestan Province in the parliament, admitted that although Golestan Province is located by the Caspian Sea in the north, more than 100 villages receive their water by tankers and villagers in these areas are deprived of the minimum basic services. Reports on people’s lack of access to drinking water in Jelaran villages near the border of Afghanistan, Calshour village in North Khorassan Province, Kaftar village in Eghlid (southern Iran) and Gandombar village in Kashmar (in the northeast) have been published in the state media. The few examples where officials or the state media have pointed to the absence of electrical power is related to unfounded promises which have never been delivered. Kaftar village in Eghlid in southern Iran and Jelaran village near the Afghan border in the northeast are two examples that have electrical power for only one hour. According to Alireza Ebrahimi, the villages of Golestan Province face serious problems with regards to schools and health clinics. Seventy percent of Cheshmeli village in Golestan Province (in northern Iran) is unsafe. Subsidence of earth, creation of deep ditches, and the danger of landslides have made these villages really unsafe. Nevertheless, the houses made of adobe are not resistant. There are no government resources to resolve the housing problem of village inhabitants. Iran’s villagers also face problems with their transportation. The roads leading to many of these villages are unpaved and difficult to pass. They are blocked with any slight rain or snow and there is no public transportation. Moor-e Zard-e Zilaii village in Boyer Ahmad (southwestern Iran) with a population of 773 people is one of the villages that has no proper roads. In one instance, a woman who had suffered high blood pressure died because she could not be taken quickly to any medical center as the village’s road had been blocked after rainfall. Health problems are rampant in villages. There are no public baths or toilets in Jilaran village. Families have put clods together and made an outdoor toilet. Bathing depends on water tankers and whenever they arrive. If the weather is good and water arrives in the village, and there is water more than basic needs such as drinking, some of the inhabitants can bathe. This does not happen more than once a month and often people can take a bath every three months. The government does not solve any logistical problems for rural inhabitants and makes the situation even worse by implementing projects detrimental to the villages’ health and hygiene. In November 2017, the people, mostly women, living in the villages of Ramsar staged a protest gathering outside the Governor’s Office in this city for several consecutive days to protest against construction of an Urban Sewage Processing Plant in their residential area. The Governor’s Office gave hollow promises to quell the protest but never delivered on his promises and the construction of the plant was carried on. The Iranian regime does not hesitate to plunder even the limited properties of village inhabitants and if they protest, the regime suppresses them. On December 5, 2017, the State Security Force attacked Jelizi Olia village in the western province of Lorestan to confiscate their agricultural farm lands in the interest of an organization affiliated with the Army. In reaction to the resistance of the inhabitants, they beat them up and injured a number of them. At least four rural women were arrested and taken away. The Iranian regime did not provide for any of the basic needs of the victims of the earthquake that hit Kermanshah, in western Iran, in November 2017. Everything is like the first day after the earthquake; children are suffering from mal-nutrition; lack of toilets particularly for women and disabled people has made the situation very critical for them. Children have been able to take a bath only four times in three months. There is one bath for every ten households and one toilet for every five households. The condition of hygiene is horrible. Lice is abundant and the clinics and hospitals do not provide any medicine to fight lice. Women suffer from infections. Pregnant women face numerous health problems. Children and most of the inhabitants have caught severe cold. People’s illnesses have become chronic and every few days, a child or a woman dies. Death of the two-year-old Sarina was a tragic example. Sarina feels bad in the middle of the night and goes unconscious. Despite damaged road, Sarina was taken to hospital, where she died in the arms of her father due to the absence of a specialist doctor and other necessary resources. Still, half of the people hit by the earthquake do not have a trailer to live in. Providing for the family’s food security is among women’s duties as half of the productive human force in villages. In many Iranian villages, people are living below the minimum humane conditions. Hosseinabad is a village in the middle of the desert. The inhabitants of this village eat hay as their main food. Drought has engulfed the entire region and people are drastically poor. The aqueducts in this village have dried out since 20 years ago. They are not given water pumps for farming because they do not have documents of ownership of their lands. This is while they have inherited their lands down the generations. The people in this village do not have drinking water. They use the little water they have for farming to sow several hundred square meters of hay near their sheds. Some of the hay sown is used for the livestock and some is kept for human consumption. Most of the livestock belongs to masters but are taken care of by villagers. According to a general health specialist, Iran’s rural population has shrunk dramatically due to lack of food security. He states, “Presently, there is very little food production in villages and the inhabitants have not been supported in any way. One might say that in some areas, planting rice consumes a lot of water and it should be banned. But considering that no support is provided to the farmers, and they are not provided with any job opportunities to have an alternative source of income, they end up selling their lands. Presently, 40,000 Iranian villages are deserted. For the destruction of every hectare of farmland in Iran, food security of 20 people is jeopardized. Presently, the highest rate of unemployment is among those who have studied agriculture. The growth of urban population in Iran has led to ever more import of food stuff from abroad, consuming a considerable volume of the country’s oil revenues. Iran’s rural populace in 1956 made up more than 68 per cent of the country’s population. Today, over 71 per cent of the population of Iran live in the cities and the rural populace has dropped to less than 30 per cent. In this period, Iran’s population has grown four folds without any harmony between the growth of the urban population and the country’s farming capability and its food production potentials. The UN Expert Group urges all member states to recognize and commit to the right to water, right to food and the highest standards of access to health for rural women. For women residing in Iran’s villages, medical care is far from international standards. Unfortunately, these problems are considered not important by the regime’s officials and are even rarely reflected in the press. The few stories that do, give a grim picture. Iranian villages generally do not have any medical clinics or doctors. This condition is a constant jeopardy to the lives of rural women who live in unsafe and unsanitary environments. The inhabitants of Hassanabad village have to ride camels to get to normal roads where cars travel. Some time ago, one of the inhabitants who had suffered a heart stroke, died before getting to a city hospital. In January, Balal Eskandari, head of Firouz Governorate in Ardebil, announced the death of a sick woman in the Sunni village of Hashin. She lost her life due to the absence of a medical center in the village and bad roads. Chahak village with a population of 8,000 does not have even one permanent medical center. The only physician available to this village is a conscript soldier that visits patients from morning until noon. In this time period, he can visit only 15 out of some 60 patients who need to be visited. In other times, people have no access to any doctor or medics and emergency patients usually do not survive on the way to hospital in a distant location. The distance between the last village in this district to the nearest city is 60 kilometers. People living in Ermian village of Shahroud, northeastern Iran, face serious medical problems. A doctor visits this village occasionally, only once a month. Sometimes, no doctor visits this village for 4 to 5 months. Inhabitants of this village have to pay at least 100,000 toumans for transportation to go to the nearest medical center. In light of a general lack of access to medical care, one can easily imagine the medical situation of women in rural areas. According to Ali Akbar Sayyari, deputy Minister of Health, “fatality of newborn infants in Iran is five times greater than in developed countries.” Every year, 15,000 infants and some 300 mothers die during delivery. Iraj Khosronia, head of the GI Specialists’ Association, made it clear that a considerable part of infant mortality occurs in underprivileged areas and villages, because there rarely is any medical center in these areas. Fereshteh Sarbazi, member of the Association of Women and Midwives, said it is dangerous that in poor, uneducated rural communities, girl children are given to marriage and become pregnant. She emphasized that mothers under 19 years of age have a very risky pregnancy. While they need more medical care and attention, there are no such services in their villages. Lack of development and particularly lack of purified water in Iranian villages have added to the medical problems of inhabitants. In July 2017, Hassan Nouri, deputy for Emergency Operations, said 170 citizens in Dinaran village of Ardel, in Charmahal and Bakhtiari Province, became sick for drinking polluted water, 10 of whom were in critical conditions. This incident was due to the absence of disinfectant material and Per Chlorine powder in the water complex. In light of the misogynous laws of Iran, women have to suffer greatly when they have accidents. To get a sense of the situation of rural women who have accidents, let’s look at the case of fire in a girls’ school in the Kurdish village of Shinabad. As an exception, this case found its way to the press. On December 5, 2012, the classroom heater in an elementary school in Shinabad village, caught fire and 29 of the 37 girl students of the class burned in fire from 10 to 60 per cent. Shinabad village is located in Piranshahr, West Azerbaijan Province in NW Iran. A few days after the fire, Siran Yeganeh and Saria Rasoulzadeh, two of the students, lost their lives due to severe burns. After five years, the treatment of the rest of the students is still entwined with problems despite promises by government officials. In an open letter to Rouhani, the mullahs’ President, the lawyer representing the girls wrote that they have been suffering greatly for five years due to “the irresponsible approach of the incumbent Education Ministry officials.” Nonetheless, according to the misogynist laws of Iran, their blood money is calculated as half the total amount because they are girls. In November 2017, a deadly earthquake struck the Kurdish regions in western Iran. The Iranian regime officials have failed to handle emergencies and thus caused the deaths of thousands of people. The deaths of the victims have not been due to earthquake and the debris coming down on people. According to the reports coming from these areas, at least five children and a disabled teenage girl, 17, have died due to the freezing cold weather and the absence of medical care. And this situation still persists. The General Statement of the Committee on the Elimination of Discrimination against Women on Rural Women has urged all member states and the United Nations to adopt systematic measures to increase awareness of rural women about the scope of their rights to combat traditions, stereotypes, customary laws and practices that discriminate against rural women. In Iranian villages, however, we see that rural women are deprived of the most basic educational facilities. More than 98 per cent of girls in Kurdish villages and other parts of Iran drop out of school and stay home after finishing elementary education without having any professional or artistic plans or activities. Many rural families bring their daughters out of school because they do not afford to pay for their tuition. Rural girls turn into unpaid workers since very young age. Instead of going to school, they undertake their family chores because traditionally, women do most of the work in villages. Shepherding, bringing logs from distant locations, carrying heavy water containers, and doing the housework, are among the things girls do since young age instead of going to school. In this way, they help earn the family’s income. Many rural women become servants or workers since very young age. Iran’s villages generally have just one school where girls and boys study together until the sixth grade. There are no high schools in most villages. Families cannot accept the risk of sending their daughters to high school because usually, the nearest high school is a long distance away, the roads are unpaved, or children have to pass a river. So, there are various dangers waiting in the wings, also cold or hot weather, and not affording to pay for transportation are among the risks they cannot accept. Even if there is a high school in a village, it is probably mixed and there is no dormitory for girls. This is the fate of many girls in the provinces of Kurdistan, Khuzistan, Khorassan, West Azerbaijan, Hormuzgan, Sistan and Baluchistan, and Kohgiluyeh and Boyer Ahmad. Early marriage is another reason why the girls are deprived of education. About 50 per cent of girl students in border regions drop out of school due to marriage. Marriage of girl children has been institutionalized in the clerical regime’s laws. According to article 1210, the age of maturity for a girl is 9 lunar years and for a boy 15 lunar years. In addition, article 1041 of the Civil Code sanctions marriage of girl children under 13 years of age with the consent of father. Even for girls who go to school, educational condition is intolerable due to shortage of resources and facilities. Most villages face shortage of water, power and gas, and the schools lack functional lighting, cooling and heating systems. Classrooms are held in half-built or damaged buildings, trailers or even tents and sheds. Students of different ages and levels study in the same classroom. Many villages lack any place with a ceiling which they could call a school and children study in open areas amidst dust and dirt. Schools lack lavatories and children do not have access to drinking water. Desks and benches are basically non-existent and if any, they are old and worn out. On April 13, 2017, the ceiling of a classroom in the town of Sirik collapsed and a girl student was hurt in the eye and sent to hospital. Sirik is located in the coastal Hormuzgan Province in southern Iran. Although the Iranian regime is not transparent in providing figures and statistics, but a review of the little figures provided in the media shed light on part of the truth. Ali Bagherzadeh, head of the Literacy Movement Organization, announced that the number of absolutely illiterate individuals in Iran is 8,000,790. According to Bagherzadeh, “63 per cent of the illiterates” are women. He said the number of absolutely illiterate women is 1,682,000 in the 10-49 age group. Government officials had previously announced that the number of children deprived of education is 3.2 million. Considering that 60 per cent of these children are girls, at least 1.9 million girls are illiterate and deprived of education. He also put the number of individuals with low literacy at 10 million. These individuals have studied only the elementary school. According to the data published in February 2018, some 120,000 girls and boys in Sistan and Baluchistan Province are deprived of education. In November 2017, all the girl students in the Zilaii region in Boyer Ahmad, had to quit their school because there was no separate school for girls and their families did not afford to pay for their transportation to a segregated school in another place. Despite Iranian women and girls’ enthusiasm in pursuing education and a better future, they face numerous obstacles created by the Iranian regime. Rural women face additional discrimination due to poverty. Rural women in Iran are systematically deprived of education. A considerable number of rural girls never find the opportunity to go to school. Those who do, are usually forced to withdraw after finishing their elementary school. There are no laws to prevent depriving girls from education. Education of rural women or girls bears no importance for the government. Instead of solving the problems caused by poverty and providing facilities for girls, government officials try to portray this situation as a cultural phenomenon to blame the families and evade responsibility. The UN Human Rights Council has obliged governments to ensure a national legal framework in line with international human rights standards, including with regard to the age of maturity and the legal age for marriage for girls and boys, the prohibition of forced marriage, and birth and marriage registration. The Iranian regime’s civil code and laws have set the legal age of marriage at 13. The father is permitted to force his daughter into marriage even under this age upon confirmation by a judge. In some parts of the country, children are traded and sold under the pretext of marriage.This was acknowledged by Parvaneh Salahshouri, head of the women’s faction in the mullahs’ parliament, in December 2017. On October 8, 2017, Nahid Khodakarami, member of Tehran’s City Council, revealed in a tweet that 37,000 girl children under 13 have gotten married over a year, 179 of whom were girls under 10 years of age. Preceding her was Shahla Ezazi, director of the women’s study of the Sociology Association of Iran, who announced that the number of child marriages was growing. She said the number of child marriages in Iran in 2016, had increased by 10,000 compared to the previous year. She also pointed to the growing number of divorcees between 10 and 18 years of age. At a seminar in December 2016, it was revealed that from 43,000 girl children between 10 and 15 years of age, 2,000 had been widowed. This indicates that the alarming figures presented by the City Council member was a minimization. According to the statistics published by the Presidential Directorate on Women and Family Affairs, the number of girls under 10 years of age forced into marriage in recent years has been as the following: 220 girls in 2011; 187 girls in 2012; 201 girls in 2013; 176 girls in 2014; and 179 girls in 2015. Mahrokh Bolouri, general director for Women and Family Affairs at the Governorate of Zanjan, revealed that 1,485 girls under 14 years of age had married in 2016 in Zanjan Province, alone, 47 of whom had gotten divorce. Another official also said that more than 4,100 girls between 10 and 15 years of age had been forced into marriage in 2016 in East Azerbaijan Province, alone. According to the research done, the highest rates of early marriages have been registered in the provinces of Razavi Khorassan, East Azerbaijan, Khuzistan, Sistan and Baluchistan, West Azerbaijan, Isfahan and Hormuzgan. Aside from the fact that officials and state media are not tansparent, due to the absence of proper registration systems, many of the marriages particularly those taking place under the legal age of marriage and particularly those taking place in villages, are not registered at all, and thus not considered in the statistics. Marriage of girl children in Iran is one of the inevitable products of a misogynous ideology on which the policies and laws of the ruling regime rely. Based on the clerical regime’s viewpoint, woman is not an independent human being enjoying her own rights, but a second hand human being who is in the ownership and service of man. The same thinking is clearly institutionalized in the regime’s laws. The age of marriage has been set at 13, but fathers have the right to force their daughters into marriage even under this age, depending on the approval of a judge. Forced marriage relocates the girl to a house which is formally and legally headed by a man and her first duty is to comply with whatever he says in every affair. Some people are naively trying to have a bill passed at the parliament to raise the legal age of marriage. But political and religious officials oppose it. Salahshouri had earlier revealed that even female officials oppose raising the legal age of marriage. The UN obliges member states to refrain from threatening, harassing, criticizing rural WHRD’s and develop national protection policies designed to protect WHRDs from attacks from both state and non-state actors and create an enabling environment for WHRDs to do their work free from harm. In Iran, however, misogyny has been institutionalized in the law and the ruling regime has not signed any of the UN conventions prohibiting violence against women, including the CEDAW. Twenty-five years after the Beijing Platform for Action, the Iranian regime is moving in the opposite direction. In such circumstances, it is clear that violence against women, in general, and violence against rural women, in particular, are common practice. Rural women live in isolated, tribal areas without any information, communication and without any agency supporting them. These elements adversely contribute to an atmosphere that never mentions them or their fate. In December 2017, Parvaneh Salahshouri, head of the women’s faction in the mullahs’ parliament, acknowledged that domestic violence against women pervades the society but not much attention is paid to it. Morteza Andalib, head of the Department of Social Studies in the Judiciary’s Social Directorate to Prevent Crimes, said sexual, mental and verbal abuse, isolation of women, terrifying women, questioning their capabilities, pressuring them for choice of clothing and covering, humiliating women in society, controlling their expression, economic violence and imposing restrictions on women in financial affairs and denying their ownership are among the most common forms of violence against women in Iran. Of course, issues of women, particularly rural women rarely find their way into the media, but the limited number of reports which find their way to the press give a small picture of an incredible catastrophe. Aside from the violence inflicted on women directly by government agencies, the most common form of violence against women is coercion and beating by husband. This is of course sanctioned by the law that views man as head of the household. Fatemeh Javidan, a family doctor who works in rural areas of Bourang village in Birjand, recounts some of the examples. In July 2017, a teenage girl was shot dead by her brother for refusing to accept forced marriage. Her name was Nargess Ali Shojaii, 17, from one of the villages of Behbahan, in Khuzistan Province, in southwestern Iran. The young woman committed suicide after her family pressured her to marry her cousin. A few hours later, after she was saved, her brother shot here three times at point blank range. In February 2018, a man massacred all her brother’s family members under the pretext of illicit relations of his niece. A 32-year-old woman by the name of Mohaddesseh, a victim of acid attack, died in hospital in July 2017 after 20 days of suffering. She came from the village of Posht Bastam in the city of Shahroud in northeastern Iran. She had been attacked by her brother-in-law who disagreed with her marriage. Other statistics indicate that 13,370 cases of domestic violence have been reported to the Social Emergencies over the past year. Some 2,000 of these cases were reported to Crisis Centers. In the first four months of this year, names of 12,159 women were registered by the Coroner’s Office as victims of violence.In the same period, 255 women referred to the branches of the Coroner’s Office in Kohgilouyeh and Boyer Ahmad Province,filing complaints for being battered by their husbands. Last year, 237 cases had been registered in the same period, which indicates a 12.23 per cent increase. Mohsen Arshadzadeh, general director of welfare in East Azerbaijan Province, announced that 490 cases of domestic violence had been registered in the first six months of this year. According to the spokesman of the Legal and Justice Committee of the mullahs’ parliament in December 2014, the statistics published in the media is “less than 35 per cent” of the actual number of domestic violence that is reported. Citing the outcome of a research, Mohammad Ali Esfenani said 128 out of 180 cases of domestic violence against women are not reported for various reasons. Iranian women have endeavored to initially correct the pervasive violence against women in the laws. They have raised the issue through pro-women personalities and officials, but the bill has not been examined, yet. Leila Arshad, a women’s rights activist, complained that the bill supporting children and preventing violence against women has not been examined by the parliament, 10 years after being proposed. On August 24, 2017, the Judiciary’s legal deputy, Zabihollah Khodaiian, declared his opposition to the adoption of the bill preventing violence against women in line with Friday prayer leaders and other religious scholars. Men’s opposition to the bill is obvious, but women who hold management positions are worse than men in their opposition to the bill. Clearly, in such an atmosphere, there is no opportunity to follow up and raise the issue of violence against women, in general, and violence against rural women in particular. Women who live in isolated tribal regions, without any information or communication and without any agency to support them, are not mentioned anywhere and their fate remains unheard of. The General Statement of the Committee on the Elimination of Discrimination against Women urges all member states and the United Nations to promote full employment and decent work for rural women. The recommendations included in the UN General Assembly’s Working Group’s document urge UN member states to redistribute and resource paid and unpaid labor of rural women and to ensure just and favorable conditions of work, including non-discrimination, equal remuneration for work of equal value, living or fair wage floors. The head of the Presidential Directorate on Women and Family Affairs acknowledged that in the women’s community, rural women’s sector is particularly oppressed. These women have to do various difficult jobs like working in farms and agricultural fields at all stages and shepherding, as well as housework and handicraft. These women have a large economic and social share in all the works and production in every village. There is no official and accurate data on women engaged in the agricultural sector. Their activity in the agricultural sector is unofficial and they have no direct income. They view themselves as housewives. Women who plant rice do more than 60 percent of the planting and harvesting of rice but their wage is 10,000 toumans less than the wage of their male counterparts. A seasonal female worker participates in all stages of plantation and harvest of rice. In other seasons, they work in other farms. Most of these women suffer from rheumatism and arthritis. They tie their knees with cloth and go to work again. Often, the farm owner does not allow them to wear boots or use gloves. Many of these women start training at the age of seven without receiving any wage. Then they have to do the work for lifetime, even in the final months of their pregnancy. Their hands get blistered and bruised. They contract fungal diseases and fever. They do not have insurance and they do not own any land. But their work is not limited to the land they work on. In the hours they do not work on the farm, they have to do all the house work. From early in the morning until they go to the farm, they have to tend the poultry, do the housework, wash the clothes, cook the food, etc. After returning from the farm, they have to bake bread, tend the livestock, and do other chores around the house. Since old times, women worked shoulder to shoulder with men in agriculture and husbandry. Today, however, earning a living has become difficult due to poverty and economic recession and also because women have bad or no guardians; this leads women to do more work and earn less. Women work twice as much as men and receive half of their wage. So, the farm owners prefer to hire women. Harvest of potatoes is also part of the agricultural work women engage in but women workers harvest between 50 to 70 sacks of potatoes every day for only 350,000 toumans. Carpet weaving is another job that rural women spend most of their life on. Touran is from Fordou village in Qom. She weaves carpets. Her fingers have been chapped for years. A rich merchant living in Germany, orders carpets to Touran. She weaves the carpets which will decorate the houses of rich Europeans. It takes six to ten months, day and night, to weave every carpet. Finally, Touran does not earn anything from her work, but her husband receives only 20 million toumans from the sale of each carpet. Most women in this village, including Touran’s mother, suffer from consequences of carpet weaving until they are no longer able to tie the knots and their skeleton changes shape because of sitting long hours behind the carpet’s scaffold. Until the end of their lives, they suffer from joint pain in the pelvis. These women have no conceivable future. Although they carry the economic burden of the family, but they do not even own their house. Their husbands own everything. The majority of carpet weaving women are deprived of insurance. Iranian women, particularly in villages, do heavy and intolerable jobs to earn their living and provide for their expenses. The state-run ISNA news agency published a report on the efforts of women who in the absence of men built roads for the Gol-e Sorkh village, in Charmahal-e Bakhtiari. These women did not receive any wages for their 12-hour-per-day heavy work until the road was finished. The Iranian regime has degraded the status of rural women to slaves who have to constantly engage in difficult and heavy jobs both at home and outside to provide for their own and their children’s needs but are deprived of every right. Many village inhabitants move to cities because they do not have any jobs or careers and are in financial straits. Since they do not have any savings or assets, they settle in the cities’ outskirts. These people, particularly women and children, are in danger of addiction, child abuse, illiteracy, health problems, and all sorts of social ailments. Young women and girls, in particular, get involved in sexual abuse, panhandling and addiction. According to a sociologist, shanty town dwelling is a widespread phenomenon expanded to many provinces. Class difference is so deep that the food and things a poor man can find in a city trash bins is more than what he can earn in his own village. A presidential deputy announced that the number of people living on the outskirts of Iranian cities is around 11 million and growing. She said seven percent of the rural population has been displaced. One of the reasons for such migration is that the income every village man can earn in the village is 40 per cent less than what he can earn in a city. More than 51,000 people live in the margins of Chabahar. This is while the total population of this city is about 100,000 people. According to the governor of this region, shanty town dwelling has had a cancerous growth. Women and children living in this area are deprived of the minimum health care, infrastructure, drinking water and educational space. This place is notorious as the worst place in Iran. There are 1.2 million people living in the margins of Mashhad. This population is twice as much as the population of Finland. 1.5 million people live on the outskirts of Tehran and another 2.5 million live in shanty towns around other cities in this province. The largest number of people living in shanty towns is attributed to Tehran’s district 16, but there is a region in Tehran Province which includes Pakdasht, Ahmadabad and Ghiamdasht, and has the largest number of shanty dwellers. These people have no building to live in, and they have built some shelter for themselves with whatever they could find. Many of them have contracted fungal and infectious diseases due to lack of water and bad hygiene. The hands and limbs of children who play on these dirty grounds are always marked with scars. Since young age, these children witness people around them consume narcotic drugs. According to those who live on the outskirts of Chabahar, the inhabitants of Camb village have paid four years ago to buy a branch of electric power, but no measures have been taken so far. The residents of this area have to buy water and bring it to their village by tanker despite the fact that they do not have any incomes. Of course, this water is never enough for the people of this village and their crowded families. The sanitary conditions are catastrophic because those who live in the shanty towns live next together. Sometimes, four or five families live in the same house and their illnesses are passed around. A member of the City Council admits that wrong policies and lack of proper planning in attending to the problems of villages has led to migration of their inhabitants to major capitals such as Tehran. According to a member of Tehran’s City Council, child laborers, panhandling, cardboard sleeping and many other social ailments are among the consequences of people having to live in the shanty towns. Giving birth is a complex issue among female cardboard sleepers and women who live in the shanty towns. According to a sociologist, prostitution is often born in regions which are economically and culturally poor. Their clients, however, come from well-off districts and have money and resources. This class difference reproduces social ailments such as prostitution. Even if several women in a neighborhood resort to prostitution out of financial need, they may drive other women towards this business. Part of the petty sale of narcotic drugs is done by women who live in shanty towns because these women are at the disposal of their husbands. On the other hand, they gradually conclude that they need to earn money in order to be able to live and they resort to this venture. he UN Women, International Fund for Agricultural Development (IFAD), Food and Agriculture Organization (FAO), and World Food Program (WFP) have urged member states to address discriminatory laws against women and launch initiatives to ensure rural women realize their full potential and rights. What is seen in Iran, however, is totally and fundamentally different from United Nations’ goals. The Iranian regime’s laws have obstructed women’s independence and equal social standing wherever possible. According to Article 1117 of the Civil Code, a man can prevent his wife from having a job. Iranian woman who depends on her husband’s permission to earn her living, loses her source of income after her husband’s death. According to Article 946 of the Civil Code, a woman with a child inherits only one-eighth of her husband’s property. If a man has more than one wife, as sanctioned by the regime’s laws, the one-eighth share is divided among the wives. If the deceased man does not have any children, then one-fourth of his property goes to his wife or wives. Now, if a woman dies, while she has no children, her husband inherits all of her property. So much for women’s equality and empowerment. There are an estimated 10 million rural and nomad women in Iran. These women work in step with men and are actively engaged in all stages of agricultural and animal production. In the little time left, they engage in handicraft like carpet weaving and other housework. Rural women produce more than 70 per cent of vegetables, and are engaged in 90 per cent of activities related to silkworms’ nursery, and in about 70 per cent of the activities related to rice plantation. In addition, rural and nomad women are in charge of more than 80 per cent of husbandry activities particularly with regards to birds and light livestock, and more than 90 per cent of olive production in workshops and houses. They also produce more than 80 per cent of the handicraft. Traditionally, women have an essential role in the village and household’s economy. In northern Iran, women have a significant role in agriculture and plantation of rice. In some regions, they tend the gardens. In central regions of Iran and in farm, husbandry and handicraft production, women play a significant role. One of the most important sectors where the role of rural women is great, is environment and tourism. Because of their ability to produce handicraft and its relation with tourism, women are more skillful in attracting tourists. Contrary to the major role of women in the rural economy, the owners’ share is very little. She does not receive any wages from anybody for the work she does. Even the wage for her work on the farm and in the fruit garden is directly paid to her husband. he General Statement of the Committee on the Elimination of Discrimination against Women on Rural Women has urged all member states to involve rural women in all aspects of planning, implementation and evaluation of all policies and programs impacting on their lives, and enhance representation of rural women in parliaments and executive bodies. Iranian women’s participation in political management of the country is too meager to account for rural women’s share. The largest figure the Iranian regime has invested in for its propaganda is the number of women assisting in the administration of villages. According to the data announced by the state-run media, the number of female assistant governors of villages is growing, but their number is still much too small to have an effective impact on decision-making. The number of female assistant village governors across Iran amounts to 2,167. This is while the total number of assistant village governors is 33,535. Such extensive propaganda by the regime is to underscore women’s 6.5 per cent participation in the management of villages who have no room for maneuvering under the shadow of men’s permanent and absolute majority. In addition, many of these women have been appointed under special circumstances. For example, Fatemeh Bolouki, assistant governor of Golbou Sofla village, and Zahra Saadabadi, assistant governor of Shahr-e Kohneh village, were among the first women to be appointed as assistant governors for Miyan Jolgeh district. Both of them were chosen because the villages’ men had already migrated to cities and there were not any educated men in their villages. Women’s presence in other political management levels has already been studied and published by the Women’s Committee of the National Council of Resistance of Iran. One of these four women was Marjan Naz Ghelichi, governor of Bandar Turkman, who was killed in the incidents of Mena, decreasing the percentage of female governors to 0.7 per cent. Two of these women are mayors of the small towns of Louleman in Gilan Province, and Kalat in Sistan and Baluchistan Province, which are hardly found on the map and in the list of Iranian cities and towns. The number of district mayors: Seven women among a total of 1034, two of whom had difficulty overcoming discrimination to achieve their positions. Last year, the Provincial Governor of Khuzistan, Abdol-Hassan Moghtadaii announced the appointment of eight district mayors. Shortly afterwards, the appointments were withdrawn in the face of objections by religious scholars, leaving only two of the women to serve as district mayors. peaking of access to the internet seems more of a luxury for rural women in Iran who hardly have access to water and other vital needs of life. Iranian women have made up more than half of university admissions and graduates in recent years despite numerous legal and social obstacles and restrictions, limiting women’s admission, and gender-based segregation of universities. This in and of itself shows Iranian women’s enthusiasm for progress. Ironically, the Iranian regime claims that it has provided high speed internet to 25,000 villages over a-year-long period. Bagher Ismaelzadeh, mayor of the central district of Andika, in Ahwaz, in the southwestern province of Khuzistan, has revealed that 148 villages in this district do not have a simple telephone, something protested repeatedly by the residents. Bagherzadeh stressed that the number of villages having access to the internet is just a few. But even if the original claim were partly true, one must expect gender discrimination in the enjoyment of access to the internet. In light of the clerical regime’s lack of transparency, the following statistics must be regarded with reservations. The presidential directorate on Women and Family Affairs published a map showing women’s access to the internet in each province. The highest number of women having access to the internet was in Semnan Province with 38.54 per cent of users being women between 15 and 54 years of age. This figure stands at 31.93 and 25.84 per cent in Tehran and Isfahan, respectively. The lowest number of female internet users are in Sistan and Baluchistan Province with only 4.47 per cent of women having access to the internet. In the 15-54 age range in Sistan and Baluchistan, only 10.01 per cent have access to computers. A comparison between richer provinces and the underprivileged province of Sistan and Baluchistan gives a yardstick on the conceivable share of internet access for poor rural women. Obviously, one cannot expect to find a large number of rural women among the 4 per cent of female internet users in this province. hotos of rural women who carry the burden of life in underprivileged villages are more telling than anything else. Zilaii is a conglomerate of villages in the Margon district of the city of Boyer Ahmad in Boyer Ahmad and Kohgilouyeh Province, in southwestern Iran. The life story of the girls living in these villages are neither unique, nor the most tragic. The girls in these villages grow up fast, looking older than their birth certificates. The common pain overshadowing their lives is poverty. All of them suffer from mal-nutrition. There is no water in their villages. Women have to bring water from a spring using 40-litre containers. They have to walk this distance several times a day. The story of their lives begins with hard work. They collect bushes, wood sticks, and logs. They have to shepherd the livestock and constantly walk up and down a mountainous region. Most of them start collecting logs in the mountains at the age of seven or eight. They bring logs with them to keep the furnace in their house burning. These houses have been waiting years for gas pipelines. Every generation has passed this desire to the next generation until today. So much heavy and hard work has made these girls weak and old, such that they look like old women at the age of 25 and 30. Iran: Women participate in protests in Rasht, Arak, Tehran, etc.